When was the last time you saw a good ‘magic’ film? You know, those cheesy films of the eighties and nineties where a character swaps bodies or has a mannequin come to life or lives the same day over and over and over? I think they were a product of their time, and I challenge filmmakers to make a new one that I like anywhere near as much as a classic like Groundhog Day. 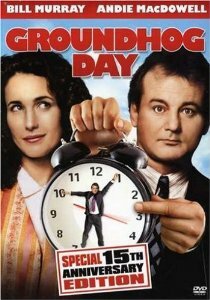 Phil (Bill Murray) is a cynical weatherman being sent by his network to Punxsutawney, a small town that holds a large ceremony each year to celebrate Groundhog Day. (For those who don’t know, on Feb 2, folklore states that when a groundhog emerges from its burrow, if it sees its own shadow, winter will continue for six more weeks) Rita (Andie MacDowell) is his new producer, a gentle and kind woman. Phil is desperate to get home, but they are trapped due to a blizzard. When he wakes the next day it is, in fact, the same day. And this continues for quite some time. Bill Murray is just so great, he plays the really nasty grump who says awful things to people all of the time perfectly, though his transformation seems somewhat cynical. But Andie MacDowell as the love interest – she’s just so bland. I just re-watched Four Weddings and a Funeral and was so disappointed in her performance in that… I honestly used to think she was great. Ah well. I guess some things should not be revisited.